3. Add overloaded versions of setDependents and setAnnualSalary that accept strings. 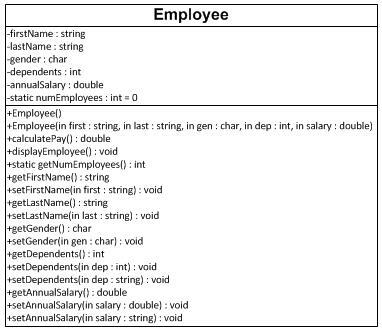 This way, we will have two “set” methods for both dependents and annual salary; one that accepts a string, and one that accepts its default data type. 1. Open the same workspace you created for the Week 2 project. 2. Create a new project named “CIS247B_WK3_Lab_LASTNAME”. An empty project will then be created. 3. Copy your main class and employee class files from Week 2 and paste them into the Week 3 project. 4. Before you move on to the next step, build and execute the Week 3 project. For each week’s assignments, you will follow these steps create a new project that reuses the program from the previous week. Using the UML Diagrams from Step 1, code the changes to the Employee class. a. Create a static numEmployees variable and initialize it to zero. b.	Increment numEmployees by 1 in each of the constructors. c.	Create an overloaded setDependents method and, this time, make the parameter a string. 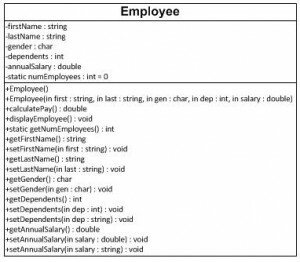 d.	Create an overloaded setAnnualSalary method and, this time, make the parameter a string. Remember that you will have to convert the string in the above two “set” methods to the data type of the attribute. Be sure you follow proper commenting and programming styles (indentation, line spacing, etc.). In the Main class, create code statements that perform the following operations. Be sure you follow proper commenting and programming styles (header, indentation, line spacing, etc.). Note that several of the steps below were accomplished in last week’s assignment. New steps are in bold. 3. Prompt for and then set dependents and annual salary using the new overloaded setters. 4. 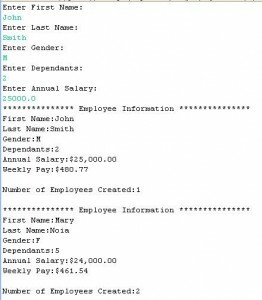 Using your code from Week 1, display a divider that contains the string “Employee Information”. 5. Display the Employee Information. 6. Display the number of employees created using getNumEmployees. Remember to access getNumEmployees using the class name, not the Employee object. 8. 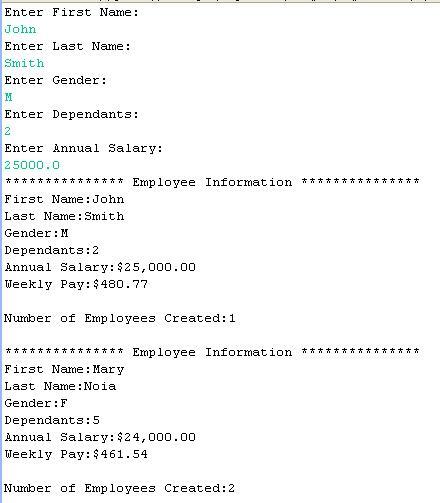 Using your code from Week 1, display a divider that contains the string “Employee Information”. 9. Display the employee information for the second Employee object. 10. Display the number of employees created using getNumEmployees. Remember to access getNumEmployees using the class name, not the Employee object. When done, compile and run your code. Debug any errors until your code is error-free. •	Capture the output window and paste it into a Word document. I have labs 1 and 2 already purchased from you. Can you send me Labs 3 to 7 as a whole with a discount. Yes Please contact me on support@iqrajavaid.com. I will share the details with you.